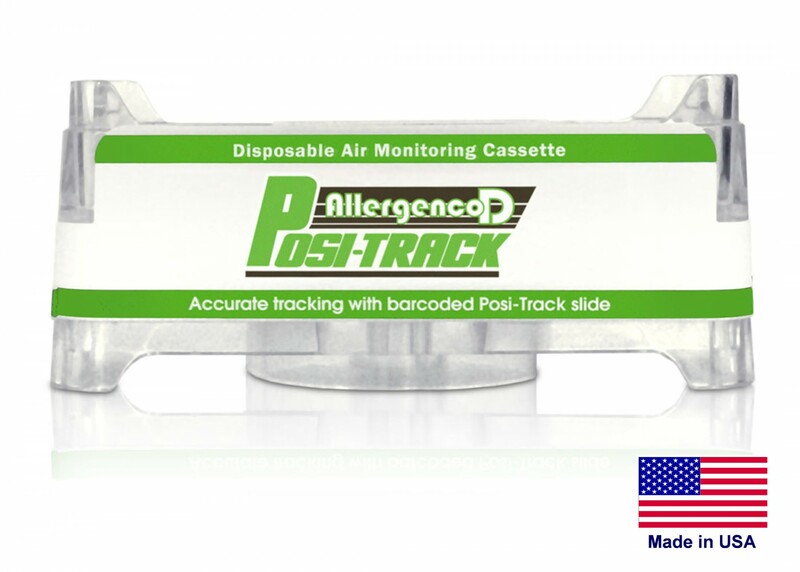 The Allergenco-D Posi-Track Full Slide, Indoor Air Quality Impactor Cassette collects mold spores, pollen, skin cells, dust, combustion particles, etc. on a standard 1”X 3” microscope slide printed with a unique barcoded serial number (POSI-TRACK). The unique barcode is printed on the completed sample slide, which insures reliable tracking throughout the sample collection, laboratory analysis and reporting process. The rear label has an expanded area for recording sample notes and field information. Ease & Speed of Laboratory Preparation and Reading – The AllergencoD Posi-Track minimizes handling and mounting of sample traces for microscopic particle counting. The Allergenco-D Posi-Track has been designed to be compatible with traditional vacuum pumps as well as most portable units. The universal fittings allow the connection to a vacuum source with either a ½” to ¼” converter or directly to a ¼” I.D. tubing. Convenient Packaging – Includes 6 Allergenco-D Posi-Track cassettes. Peer reviewed study confirms Allergenco-D’s design provides superior results! The Allergenco-D’s design goes head-to-head with the Air-O-Cell and comes out on top.